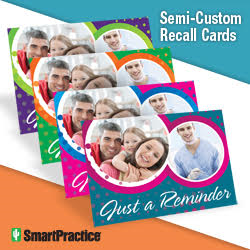 New this January, Dental Offices can build an effective recall program by leveraging the wide selection of Dental Recall Cards available at SmartPractice. SmartPractice makes it easy for dental offices to keep their schedules full and reinforce their brands with ease. The success or failure of a dental practice depends largely on patient recall. Staying connected with patients by utilizing Recall Cards is a key way to retain them. According to SmartPractice Marketing Coordinator, Heather Kalish: “SmartPractice makes it easy for dental offices to keep their schedules full and reinforce their brands with ease.” Sixteen fresh, new Recall Cards are available now for purchase. Offices can choose from several different types of Recall Cards, including a newly-expanded Semi-Custom line, as well as Custom and Pre-Designed options. All cards can be personalized with a practice logo and contact information at no cost. For customers wanting the flexibility to choose their images, color scheme and messaging, Semi-Custom is an effective option. It allows offices to coordinate their patient communications, making for a cohesive brand. SmartPractice also provides an easy-to-use online template which can be quickly updated for Semi-Custom products. And for those offices wanting a one-of-a-kind brand, Custom Recall Cards are key. Offices have the option of designing everything from their logo to the imagery they use with SmartPractice’s team of dental design experts. Pre-Designed Recall Cards, while not customizable, encompass hundreds of different styles, complemented by a message library from which customers can select the appropriate messaging. With the largest selection of dental-themed Recall Cards on the market, dental offices have the freedom to choose exactly the cards they want to enhance their brands and retain existing patients. To learn more, please call 800.522.0800 or visit smartpractice.com/dental.